The tourney kicks off with the face of the NHL front office leading the charge. Through over 20 years acting as the NHL Commissioner, Bettman has presided over 3 lockouts and complete disregard for the clutching and grabbing type of obstruction calls that stifle offensive creativity. He's universally disliked by the fanbases of all 30 teams and will be a strong contender for a deep run. Joining Bettman with an opening round bye will be New York Ranger defenseman Marc Staal, who has drawn the ire of Pens fans for his repeated, and uncalled, shots to the neck of Sidney Crosby during playoff action the past couple years. As much as Staal has irritated Pens fans, Brandon Dubinsky has been much worse for much longer. Dating back to his time as a Ranger and continuing and intensifying during his 4 seasons in Columbus, Dubinsky has pestered, irritated, and cheap-shotted Penguins star players, namely Sidney Crosby. The usually reserved Crosby has not made much of an effort to hide his disdain for Dubinsky, and things finally reached a boiling point earlier in the season when the league had no choice but to suspend Dubinsky for cross-checking Crosby in the neck with such force that he broke his stick, including once while Crosby was lying prone on the ice. You'll have to wait until next week to vote for Dubinsky as he gets an opening round bye, along with broadcaster Pierre McGuire. The commentator and failed Hartford Whalers GM has become an obnoxious persona for NBC's hockey broadcasts, and he'll give Dubinsky a strong challenge for winning the bracket. Amazingly enough, Pierre McGuire might not be the worst member of NBC's broadcast crew. Mike Milbury has been a bombastic loud mouth with every opportunity provided to offer his opinion. Widely regarded as the worst general manager in the history of the game, Milbury exposes an antiquated, small-minded view of the game, and he transcends almost all of the goons in the history of the game by once having gone into the stands to confront a fan and beats the man with his own shoe. 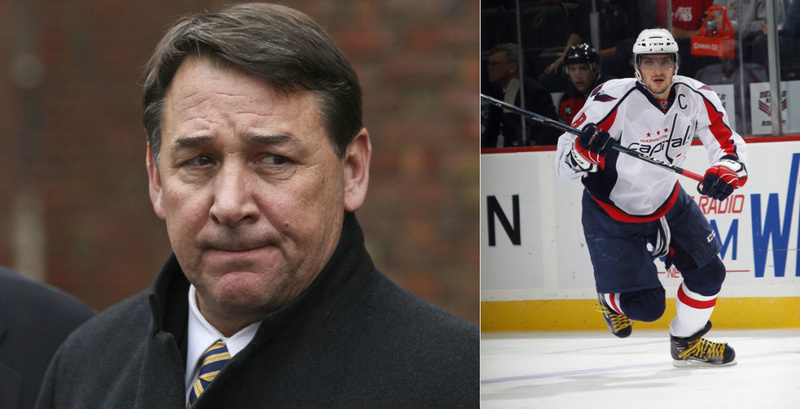 Mike Milbury makes himself an easy man to hate, and he and Alexander Ovechkin will get a bye into the 2nd round. While Ovechkin is a generational talent, he's also played on the wrong side of the line more than once or twice in his career, noticeably head hunting Evgeni Malkin for several years and taking out Sergei Gonchar with a knee-on-knee collision during the 2009 playoffs. While Alexander Ovechkin has drawn the ire of Pens fans while being an extremely talented player for an opponent, Rob Scuderi became the whipping boy of the fanbase by being a woefully untalented member of the home team. While Scuderi can't be faulted for receiving the contract he did, his play has still been below NHL standards since the day he came back to Pittsburgh. While the poor play was bad enough, Scuderi often came across as arrogant and hypocritical while criticizing his teammates for facets of the game the defenseman himself struggled with as much or more than all his teammates. Scuderi is joined by another Penguin scapegoat who was driven out of town - former Head Coach Mike Johnston. Johnston got off to a fast start in his first season behind the bench in 2014-15, but things worsened as the season progressed before finally bottoming out this year.